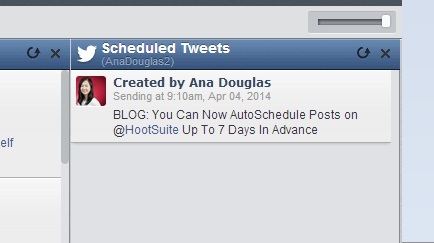 HootSuite’s AutoSchedule functionality just got a lot more awesome by not only allowing you to select the days of the week you’d like your posts to go live (up to 7 days in advance), but also by allowing you to choose the time frame during which you’d like your posts to be published. This recent update is available for all users and is combined with the already useful Hootlet Extension for Chrome. Now you can save time and ensure all your posts are published at optimal times throughout the week. 1. Choose the social network(s) you’d like your message to be published on. 2. Write your message in the compose box. 4. Next, click on the Settings button just to the left (I’ve circled it in Red below). 5. Pick how many message(s) you’d like published per day. 6. Indicate the time frame you’d like your message(s) to appear. 7. Click the days you’d like your message(s) to appear (green indicates a day you’ve selected). 8. When you’re happy with your Settings, click “Save Settings.” Then click “AutoSchedule” like usual. And voila! Your message has been AutoScheduled using your custom settings. 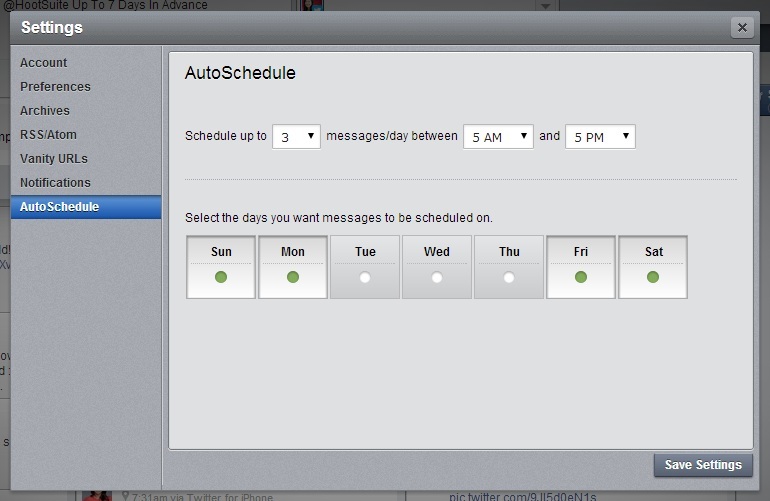 I’d say the only downside for now is that you can’t indicate which messages you’d like to appear on which day(s). At the moment you have to leave it to chance, so if you’re scheduling a contest or announcement, I’d stick with scheduling your messages manually. Next Post INFOGRAPHIC: Are You On the Right Social Media Platform? Great explanation of our update Ana — thanks for sharing!